M Blasco-Duatis, G Coenders Gallart, M Saez (2018): “Compositional visualization of intermedia agenda setting by the main media groups and political parties in the Spanish 2015 General Elections”. Revista Latina de Comunicación Social, 73, pp. 264 to 292. This article presents the compositional biplot as an innovative methodological approach to visualise intermedia agenda-setting in the study of media and political agendas in an intuitive way. As an illustration, we use a content analysis of the main Spanish media groups (RTVE, Prisa, Vocento, Unidad Editorial, COPE, Atresmedia, Planeta, Godó, Mediaset España and Libertad Digital) and political parties with a sole constituency (Partido Popular, Partido Socialista Obrero Español, Podemos, Ciudadanos and Izquierda Unida) within the framework of the 2015 Spanish general election period. Unlike traditional approaches, compositional analysis in general and the biplot in particular emphasize the relative salience of the contents within the agenda. The visualisation confirms the methodological soundness of the approach, while also providing a novel perspective of the case under study and visualizing the representation of intermedia agenda-setting. compositional analysis (CoDa); biplot; political communication; media groups; intermedia agenda-setting. 1.Introduction. 2. Theoretical framework 2.1. Intermedia agenda-setting; brief framework, perspectives and main study models. 2.2. The agenda of the Spanish media groups and the political agenda from Twitter. 3. Traditional approach to analysing content categories in the media. 4. Compositional analysis 4.1. Transformations, association and distance 4.2. Replacement of zeros 4.3. The CoDa biplot 5. Content analysis 6. Results 7. Discussion and conclusions 8. Bibliographical references. Since its beginnings, the study of agenda-setting (AS) has mainly been approached from observing content analysis based on the relative or comparative importance of some issues over others. The original precept of the concept itself posits that certain social actors (focusing essentially on the role of the mass media) are postulated as information mediators in a process that includes or omits certain issues depending on the hierarchical importance attributed to them (McCombs, 2007). The differences between senders and content categories derived from the study ae analysed either descriptively, based on the rate of occurrence of the issues, or by means of Spearman correlations, focusing exclusively on rank order. It is precisely from the essence of the content hierarchization process, in this need to determine the relative importance of the issues by senders, that the aim of this research emerges: to propose a methodological approach based on compositional analysis (CoDa), the standard statistical methodology when the researcher is interested in the relative salience of the parts of a whole (Aitchison, 1986), by means of a compositional tool to visualize data, the biplot. This visualization allows us to see which issues are prioritised, who their senders are and the relations between them, taking the fact that the salient information is the relative volume of each issue for each sender into consideration. The chosen case study in this research is the AS proposed by two social actors, the main Spanish political parties and media groups, during the period of the Spanish general election held on 20th December 2015, with the aim of achieving a compositional representation of intermedia AS. The paper has an academic structure and pays special attention to the methodological development of compositional tools and category analysis for AS. Following this introduction, there is a theoretical contextualisation of the most important concepts of the AS theory, the media groups in question and the specificities of political communication via Twitter. A framework on category analysis in the media is then presented as a prelude to introducing the methodological tool, the CoDa biplot. The fifth section develops the content analysis on the case study in question and the results are presented in the sixth section. The paper ends with a brief discussion, where the main conclusions are also drawn. The pioneering publication Public Opinion (1922) by Walter Lippmann, who is considered as the intellectual father of agenda-setting (McCombs, 2006: 26), provided a novel perspective on how communication affects the construction of the social reality. In the chapter, ‘The world outside and the pictures in our heads,’ Lippmann develops the thesis that media outlets define the cognitive map of society from their experience of the world they live in, generating an informative ‘pseudo-environment’ created by the news that is independent of the factual reality. From this perspective, at the end of the 1960s McCombs and Shaw conducted seminal research on the function of mass media agenda-setting (1972) within the framework of the influence that certain media had on the voting decisions of a group of citizens from the town of Chapel Hill (North Carolina) during the 1968 presidential election between the candidates Hubert Humphrey and Richard Nixon. McCombs and Shaw’s seminal work became the first research to empirically validate what Lippmann had discerned in the 1920 and it also served to coin the term agenda-setting to refer to the novel theory about the effects of media communication. Nowadays, the multiplicity of knowledge has exagerated society’s vision of what surrounds it. This inability to subject reality to an exhaustive, non-stop process of control has transformed into an essential task for the mass media, who act as the link between citizens’ individual experiences and knowledge of the global world. The mass media controls media coverage, including and omitting certain events depending on the degree of importance they attribute to them, thus conditioning citizens’ experience of the environment beyond their personal experiences (Fishman, 1983). This process of hierarchisation of the issues considered important to citizens’ concerns is designed to focus their attention, thoughts and actions on these issues, thus conferring the first level in public opinion forming wherein people perceive that the events that receive most coverage are necessarily the most important ones (Igartua y Humanes, 2004: 244). The idea that there is a strong correlation between the emphasis the media places on certain issues and the importance audiences attach to them forms the epistemological basis of the AS theory (Cohen, 1963; McCombs & Shaw, 1972). This function of thematising the news, in other words of including an event in the order of the day for public attention, giving it adequate importance and underlining its central importance and significance (Wolf, 1991), the mass media –irrespective of whether or not the mechanism that determines the construction of the agenda is made manifest– has been posited as as an extremely powerful tool for shaping the dominant mindset in comtemporary societies. Thus, since the beginning AS theorists’ interest has been based on demonstrating that the mass media is not only a broadcaster of information, but is also a filter for the issues included in the agenda and as such it defines the attention an issue will command at a particular moment. Studies of agenda-setting within the phenomenon of mass communication have been approached all over the world from various perspectives. From among this range of models for measuring AS and within the framework of the International Communication Association annual conference held in Acapulco (Mexico) in 1981, McCombs (2006: 71) presented a classification of the different types of relationships between the media coverage of issues and the agendas of different social actors (media, political and public), known as the Acapulco typology. This typology is defined by two dichotomous dimensions and is thus describes four perspectives defined by the correlation of: a) the focus of attention, which can encompass the set of issues that define the agenda or can be limited to a single issue on the agenda; and b) the measurement of public salience of the items on the agenda, defined by additional measurements that describe a population, as opposed to the measurements that describe individual answers. Consequently, the study of AS is especially relevant in this phase because it defines the concept of intermedia AS, in addition to establishing the interrelation of the agendas presented by different social agents (the agendas of the media, the public agenda and/or the political agenda) as the framework of analysis. In the present study, the focus of attention is the set of issues on the agenda based on the added measurement between the actors the media outlets (media agenda) and political parties (political agenda). Of the four perspectives described in the Acapulco typology, this is categorised as type one. Cross-sectional model: This model is based on the study of the relationship between analysis units in a specific, delimited space of time during which an independent variable it selected (e.g., media content) and related to a dependent variable (e.g., the opinion of the audience of this media outlet about the most important topical issues). These are then grouped and ordered according to the importance each actor attributes to them in the measurements and the data is finally correlated by means of the usual Spearman's correlations. The sign of the resulting coefficient defines the grade of correlation between the two actors and consequently between the two agendas (e.g., Conway et al., 2015; McCombs & Shaw, 1972; Ragas & Kiousis, 2010; Weimann-Saks et al., 2016). Longitudinal models: These are comprised of two different study procedures, panel designs and time series, although both models continue using a pre-study correlational phase. The premise of the longitudinal model, in contrast to the cross-sectional model, is the focus on the differences or changes undergone by one or more variables through two or more points in time. The difference between the two procedures described is the unit of analysis used because in the panel design it is generally an individual who is surveyed at different points in time, while in time series the unit of analysis is more often than not an aggregate measurement such as the frequency of certain news items, population percentages about the country’s most pressing problem, data about a relevant issue such as unemployment, and so on. (e.g., Cui y Wu, 2017: 11; Lim, 2011: 177; Luo, 2014: 1303; Min, 2004: 200; Sweetser et al., 2008: 208; Tedesco, 2006: 196). As can be seen, academics of the AS theory have tended to base their research on selecting one or more of the methodological models described, at the service of one of the four research perspectives defined by McCombs’s Acapulco typology. The comparison of a prior content analysis of the issues covered by two or more social actors (media, political and/or public) within a framework of correlations has generally managed to define the degree of inference of some issues over others and, consequently, to establish a dominant agenda over a relegated one. Notably, the methodological tool presented in this study, the CoDa biplot, serves for both cross-sectional and longitudinal models. To visualise the theory of intermedia AS from a compositional methodological approach, two actors have been selected for this study (media agenda and political agenda) in two time periods (the fortnights before and after the 2015 Spanish general election). More precisely, this research analyses the agendas of the main Spanish media groups and political parties with the aim of then bringing together the theme selection derived from each agenda. As will be be seen later in the methodological description, the agendas of the main Spanish media groups (press, radio and television) during the election campaign period were constructed from the political opinion contents of each media outlet’s opinion formers  and contributors . Thus, each political party’s agenda was built by the messages posted on the Twitter social network during this electoral period. This is why it is particularly interesting to briefly include here a framework of the media groups in the Spanish context and to mention how important Twitter is as a tool capable of influencing the public space and, as a consequence, contributing to the development of AS. Regarding the media groups, the first point to make is that the current Spanish media system is structured on a small number of large media groups, which are exhaustively controlled both in terms of the press and the audiovisual industry. Serrano (2010) identifies four particularly transcendent factors that make up the model: i) a concentration representative of the media world, which is based on a very limited range of large groups that dominate communication and culture; ii) a business logic structured by the processes of financialization (massive debt backed by the capital markets) that looks for the homogeneity of these groups in their strategies and ideologial view of the world; iii) a hegemonic composition about the logics of mass social communication stemming from the financial internationalization of the large groups and their associated investment funds; and last, iv) legislation that has looked for ease of application rather than ways to exercise real control. These precepts especially encourage a trend towards the homogeneity of information and of the formats in which it is presented. The issue selection processes that mean that areas such as health and science do not have specific spaces or independent coverage in the media sphere (Revuelta, 2006) are essentially the same as for other subject groups, such as politics and economics, which manage to monopolise and spread within the multiplicity of media of the system, for example within the structure of the debate format. This homogenisation of the ideological view of the world as one of the main axes of the proliferation of media groups (Serrano, 2010) poses a direct question for communication science academics and, in particular, for those who study the procedures derived from the AS research model. 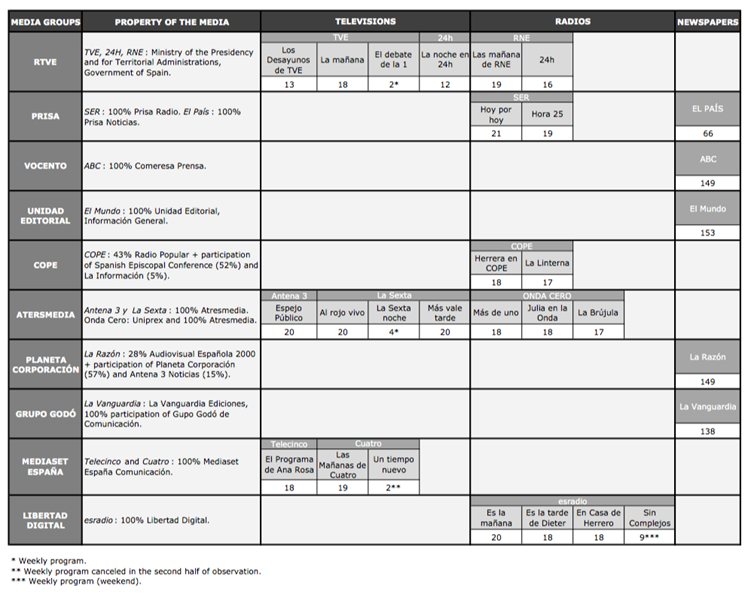 Thus, the group of Spanish media outlets integrated into the present compositional study on intermedia AS is clearly representative and the aim is to construct the media agenda for the study period in question, dividing the outlets into five types of structures according to their ownership status: RTVE group, the state-owned public corporation; Atresmedia (including Planeta-DeAgostini), Mediaset España, Prisa and Vocento, all publicly traded companies; Godó group, owned exclusively by a single family; COPE group, owned mainly by the Spanish Episcopal Conference; and the groups Unidad Editorial and Libertad Digital which, although they have shareholders in common, work from independent group structures that belong to foreign investment groups. And yet this enormous concentration of media outlets described not only works against informative pluralism, but also in itself generates a clear two-party framework whereby two large media groups (Mediaset España and Atresmedia), majority shareholders in the two benchmark Spanish TV platforms, claim (according to data provided by Infoadex ) not only more than 80% of the income from TV advertising in 2016 and more than 50% of the total audience (according to data from Kantar Media for 2016 ) but also, together with Prisa and Mediapro, they exercise overwhelming control of the contents market (series, films, rights to broadcast sports, and so on). In brief, this contextualisation describes the relationship established over time between the power elites (political, economic, business, etc.) and the media, a link characterized by mutual interdependence in their strategies to attain some specific objectives: the first to ensure favourable media coverage and the second to bring the contents of these elites closer to their audiences (Blumler and Gurevitch, 1995; Blumler and Kavanagh, 1999). More recently, the main research on this subject has challenged these precepts, demonstrating that the power elites in particular in the political arena, are becoming increasingly dependent on the media as a result of mediatization. This term refers to the degree of independence between the power elites and the media (Blumler and Kavanagh, 1999; Marcinkowski, 2014; Mazzoleni and Schulz, 1999; Strömbäck, 2008) and it is precisely these correlations that define the impact between the forces that are subject to the projection of the media and, consequently, of society. This leads us to comment on the theoretical fundaments of the AS of the second actor under study here, the political parties, in the digital sphere of the social network Twitter. Microblogging web platforms like Twitter have reversed influence processes, taking the message not only from traditional means of communication to the public, but also from political parties to citizens, so much so that over the last decade research in the field of the AS theory has focused on studying digital means of communication as new spaces capable of influencing the public space (Bruder, 2008; Krane, 2010; Meraz, 2009; Orihuela, 2011). Twitter currently has 320 million registered users from all over the world and has become one of the social tools of communication most used by the main political leaders. Since Barack Obama’s 2008 electoral triumph, which became the paradigmatic scenario of the power of the digital sphere and social networks to construct an electoral conquest based on the direct action of social followers, social media has become an essential tool for developing political life and for electoral campaign processes in particular (Perlmutter, 2008; Towner & Dulio, 2012). Among the diversity of the media, social networks have emerged as a singular environment due to the way they connect users and facilitate interaction between the political and the public spheres. Twitter in particular has been posited as a new political space to disseminate information to a growing audience (Conway, Kenski and Wang, 2015: 365), becoming a reference tool for compiling information, improving the link with the public (potential voters) and following the actions of sources (Parmelee, 2013). This platform has also emerged as the most popular of the set of social networks to participate in political persuasion with the capacity to draw traffic through all the platforms, as the issues emphasised in tweets are often commented on later on radio and TV talk shows and in the press (Parmelee & Bichard, 2012). Within this context, Twitter has proved to be a powerful tool to construct a discourse of the characteristics of the new media eco-system, which can be described as extremely brief, very fragmented, disseminated incredibly quickly and having enormous potential to spread exponentially through the dynamics of viral recommendation and diffusion. Incorporating the information supplied by political parties’ messages via Twitter into this study is therefore especially pertinent, as the thematization of the main news items that compile each political parties’ argument, and hence their political agenda, can be systematized from this framework. 3. Traditional approach to analysing content categories in the media. As mentioned above, the very nature of the AS theory means that content analyses generally focus on the relative or comparative importance of some contents over others. It is assumed that some media or social actors are more active than others regarding certain issues, leading to a general study of the relative volume of information about issues to the detriment of the detailed analysis of the content. In most cases, this is evidenced in the formulation of hypotheses and research questions expressed in comparative, relative or competitive terms. Literal examples of research questions that clearly allude to a comparative focus about agenda-setting in different media are plentiful: 'prominent topics in Twitter messages compared to prominent topics in surveys and in television news programs’ (Jungherr et al., 2016: 54), 'Is there evidence that the balance of mass media to citizen media influence differs among independent bloggers of diverse political ideologies based on different types of issues?’ (Meraz, 2009: 687), ‘Are there similarities between @London2012 and #London2012 in terms of tweet focus (i.e., topic)?’ (Frederick et al., 2015: 317), ‘What are the issues emphasized in the online public agenda, the media agenda, and the policy agenda?’ (Luo, 2014: 1293), ‘The MH370 incident quickly dominated the news agenda across many countries’ (Cui & Wu, 2017: 2), ‘is Twitter mainly rehashing mainstream media content?’ (Rogstad, 2016: 145), ‘The assumption that news media emphasize and highlight certain events’ (Weimann-Saks et al., 2016: 730), ‘The salience of issues in MoveOn.org ads will be positively associated with the salience of issues in Obama in 30 Seconds ads’ (Ragas & Kiousis, 2010: 567), `The issue salience of blogs will show a significant positive correlation with issue salience of network television news programs’ (Sweetser et al., 2008: 204), ‘What were the most important attributes of the Iraq War in the newspaper coverage of the United States, Mainland China, Taiwan and Poland?’ (Guo et al., 2015: 349), ‘How did the news agendas of the Sunday Times and Rapport differ on their front pages, with regard to their lead stories?’ (Naudé & Froneman, 2003: 87), ‘What were the most frequent policy issues (issue agenda) discussed by the media in regards to each object nation’ (Besova & Cooley, 2009: 225). The italics are ours. The simplest way to assess similarity among senders of political information according to the relative importance of the content categories they send (issues) and to determine which of these categories contribute to their differences, is to compare the frequencies of the top contents (Guo et al., 2015; Jungherr et al., 2016). Table 1 contains fictional data for six senders (E1 to E6) and their top three content frequencies (C1 to C5). For the sake of simplicity, only the similarity of E1 to all the other senders is assessed. To all intents and purposes, E2 looks identical to E1, even though the way the data are presented in absolute terms makes this difficult to discern at first glance. E3 also seems to be identical to E1. The first two categories in E4 and E5 are the same as in E1, but they differ in the content ranked third, while there is nothing to indicate whether one or the other is more dissimilar from E1. E6 has the same top three issues as E1, albeit with different frequencies. A key question misleading how a table like this is interpreted is that the different senders are compared based on a different set of issues. In other words, we do not know the frequencies of the omitted issues, which may be just marginally below the frequency of the third issue or may have a completely insubstantial frequency. The upper part of Table 2 is a comparison of the six senders based on the entire set of content categories that appear in the top three lists of at least one sender. In this way, we ensure that mutual comparisons among senders are made on a common basis. For ease of interpretation, the central part of the table contains proportions instead of absolute frequencies. Some authors prefer to use rankings (e.g., Besova and Cooley, 2009; Cui and Wu, 2017; Lim, 2011; Ragas and Kiousis, 2010), as shown in the lower part of the table. From the second part of Table 2 it can be deduced that sender 2 is identical to sender 1. On the other hand, sender 3 is markedly different. In comparison to sender 1, sender 3 has a threefold increase in C5 (0.139 / 0.042 = 3.33) and compared to sender 3, sender 1 has a fourfold increase in C4 (0.125 / 0.018 = 4.50). It also becomes apparent that sender 4 is more different from sender 1 than sender 5. Compared to sender 1, sender 4 has a fourfold increase in C5 (0.167 / 0.042 = 4.00) and compared to sender 4, sender 1 has a fourfold increase in C4 (0.125 / 0.018 = 4.50). Regarding sender 6, the differences with respect to sender 1 seem sizeable in absolute terms, but not as large in relative terms, because they occur in content categories that have high proportions in both senders (0.514 / 0.417 = 1.23 and 0.250 / 0.153 = 1.64). Thus, if the research questions focus on the relative importance of the contents, then this must be duly taken into consideration when analysing the data. While the second part of Table 2 could constitute a solid focus of analysis and similar tables are often used (Frederick et al., 2015; Luo, 2014; Min, 2004; Naudé & Froneman, 2003; Rogstad, 2016; Rubio-García, 2014), there is a general lack of concern with how content categories contribute to generating differences among senders, be they relative or absolute. Such differences (or similarities) are often assessed by means of Spearman’s rank correlations among senders based on the lower part of Table 2 (e.g., Conway et al., 2015; Cui and Wu, 2017; Lim, 2011; Luo, 2014; Ragas & Kiousis, 2010; Weimann-Saks et al., 2016) or by means of other types of rank correlations (Min, 2004). This is tantamount to taking neither relative or absolute differences into consideration, but only the rank ordering, thus wasting any other information. For instance, according to Spearman's correlations, in the top part of Table 3 sender 3 is as similar to sender 2 as to sender 4. The Pearson’s correlations used by Besova and Cooley (2009); Tedesco (2005) and Sweetser et al. (2008) in some ways make matters worse. Such correlations focus on absolute rather than relative differences and consensus issues may act as outliers, inflating all correlations upwards (bottom part of Table 3). c2 tests in contingency tables are sometimes used to show that there are differences among senders, but they are even less informative as they say nothing about the extent of these differences (e.g., Frederick et al., 2015; Naudé and Froneman, 2003). In the following section, a statistical analysis framework is presented which resolves the problems that arise in the study of relative differences, suitably focusing on quantitative information and classifying the information about its relative rather than its absolute differences, in addition to representing both the differences between senders and content categories. Compositional Data analysis (abbreviated as CoDa in English) is the standard statistical method used when data only contain information about the relative importance of the parts of a whole. The CoDa tradition started with Aitchison’s seminal work (1982, 1986) on chemical and geological compositions where only the proportion of each part or component is of interest, since absolute amounts are irrelevant and only tell about the size of the chemical or soil sample (e.g., Buccianti et al., 2006). Nowadays, CoDa spans almost all the hard sciences and has started to be used in several fields of the social sciences, such as education (Batista-Foguet et al., 2015), economics (Fry, 2011), marketing (Vives-mestres et al., 2016), accounting (Linares-Mustarós et al., 2018), tourism (Ferrer-Rosell and Coenders, 2016), values (van Eijnatten et al., 2015), social networks (Kogovšek et al., 2013), time use (Martín-Fernández et al., 2015a) and election studies (Egozcue and Pawlowsky-Glahn, 2011; Liscano Fierro and Ortiz Rico, 2017). Content analysis in the study of the media and media groups and the analysis of AS, which resides in the communication of these media, pose similar problems in all respects as those encountered in chemical and geological analyses. Absolute data are irrelevant and they mostly tell about the theme of the content, its intention, the popularity of the sender, and so on. In this sense, only the proportions of each content category or the relative size of one type of content over another are truly informative. In the last three decades, CoDa has provided a standardized toolbox for statistical analyses whose research questions are concerned with the relative importance of magnitudes. Dedicated user-friendly software has started to appear (van den Boogaart and Tolosana-Delgado, 2013; Palarea-Albaladejo and Martín-Fernández, 2015; Thió-Henestrosa and Martín-Fernández, 2005), as well as accessible handbooks (Van den Boogaart and Tolosana-Delgado, 2013; Pawlowsky-Glahn and Buccianti, 2011; Pawlowsky-Glahn et al., 2015). What follows is a brief outline of the method. where D is the number of components, in our case, content categories. To focus on the relative importance of the components, x is closed to a unit sum so that after its closure z contains proportions of each content category. Because of the restriction of fixed sum, most traditional statistical tools, such as mean, correlation and distance, are to a greater or lesser extent meaningless when applied to z. A proper measure of the centre of a sample of n compositions is the closed geometric mean. If gj is the geometric mean of the sample of the component zj for all n compositions, the centre is expressed as C (g1,g2,…,gD). Euclidean distances among individual compositions (senders) are also meaningless (Aitchison et al., 2000). Euclidean distance considers that the pair of proportions 0.01 and 0.02 are as mutually distant as 0.11 and 0.12, while in the first pair the difference is 100% and in the second it is less than 10%. Using log-ratios attaches greater importance to the distances of the differences in content categories with low proportions. The fact that zero replacement methods assume that most of the values are larger than zero must be taken into consideration. For alternative treatment methods for data with prevalent zeros see Greenacre (2011). Like standard data, compositional data require visualization tools to help researchers interpret large data tables with various senders and many content categories. To this end, Aitchison (1983) extended the well-known principal component analysis procedure to the compositional case. The extension boils down to submitting centred log-ratios (3) to an otherwise standard principal component analysis. Together with Gabriel’s (1971) biplot, which jointly represents cases and variables in a principal component analysis, this served as the basis for Aitchison and Greenacre (2002) developing CoDa biplots. Distances between two points are approximately proportional to Aitchison’s distances (4) between the two senders. Senders with similar content compositions appear close together. The lengths of the content category rays are proportional to the quality of the representation of components in the two-dimensional space, whose average across all components is the percentage variance explained by the two first dimensions. The orthogonal projection of the senders in the direction defined by a ray shows an approximate ordering of the importance of that content category for each sender and can be used to show how the content category contributes to differentiating senders. The origin of all the rays is both the coordinate centre and the geometric mean. A sender close to this centre behaves like the geometric average of all the senders with regards to its content share. To obtain the visualization of intermedia AS by the main Spanish political parties’ and media groups’ AS on Twitter during the period of the Spanish general election in 2015, we use a mixed methodology based on content analysis (Berelson, 1952; Krippendorff, 2004; Wimmer et al., 2006) to gather data from Twitter and the media groups. Taking the complexity of the systematization of the data in two such different and distinct environments into consideration, the following global and specific premises were considered when gathering the information. The study focuses on the the 2015 Spanish general election, and more specifically on the 31-day period from the beginning of the electoral campaign on 4th December 2015 to 4th January 2016, which were the two weeks prior to and immediately following the election held on 20th December 2015. A balance is thereby obtained between the analysis of the days of the electoral campaign itself and the days of the post-electoral campaign, omitting the day of the election itself due to the media groups altering their standard programming on that day. In this case, the data gathered on Twitter for the political parties is differentiated from the data compiled for the media groups. Regarding the latter, the media outlets (TV channels, radio broadcasters and/or the press) with integrated coverage across the whole country that impart general information (or thematic information about political opinion) and with political opinion/discussion spaces were selected. To ensure the reliability of this choice, the media outlets were also selected based on data gathered in the General Media Study (EGM) from October 2015 to May 2016  and compared with data from the OJD platform (Audit Bureau of Circulations) and the Kantar Media study. The results of this selection process coincided with the former. The following premises were also considered: i) Regarding the press, all the generalist newspapers with integrated coverage across the whole country were selected (El País, Abc, El Mundo, La Razón and La Vanguardia). Furthermore, these five newspapers ‘outline a spectrum that goes from El País to Abc, spanning practically all the ideological opinions with political representation in our country’ (López García 2004:15); ii) Regarding radio media (RNE, Ser, Cope, Onda Cero and esradio) and TV media (TVE, 24h, Antena 3, La Sexta, Telecinco and Cuatro) all the ‘non-paying’ general information media outlets were selected, in addition to the non-paying themed political opinion media such as ‘24h’, except for the COPE group's TV channel ‘13TV’, which was discarded because its audience data could not be compared as it did not participate in the audiences report of the Spanish communications media offered by Kantar Media. Regarding the political parties on Twitter, we gathered their data and compiled a database with the stream  of the set of tweets posted on the official Twitter accounts of the parties with a sole constituency in Spain who were later represented in parliament: PP, 1650 tweets; PSOE, 2825 tweets; Podemos, 7279 tweets; Ciudadanos-C’s, 2918 tweets; and IU, 7673 tweets. The parameters set in each parties’ stream of tweets from which the database was subsequently compiled were: date the tweet was posted, the time, the content of the tweet and if it was a re-tweet. With the aim of working with a representative sample of tweets that could be compared between parties, we then fixed a random systematic selection of 1000 tweets per party, which ensured proportional representation according to the date the tweets were posted. A database comprised of each party’s 1000 tweets (5000 tweets in total from the five parties) was then structured and each tweet codified. The media groups, in particular referring to the press articles, were analysed and codified with a sole codifier based on their printed version as this is a more reliable way to decide which of them fit into the genre of political opinion due to their formal structure and content. Thus, all the opinion articles from the different sections of each newspaper were gathered, excluding the editorials, because following Marques de Melo (1985) these ‘conceal a relationship of dialogue with the state,’ even when they are formally directed at public opinion. Within the context of radio and TV programmes with sections of talk shows about politics, these were codified based on the web portal of each programme and from the respective ‘a la carte’ audiovisual publications libraries after analysing the entire debate for each programme in the set that was broadcast during the delimited time period. In line with these delimitations, a first database was compiled that included the set of political opinion articles from the five newspapers and the set of radio and TV political debates broadcast by the media outlets included in the study. Table 4 shows that a total of 376 political debate spaces from the sample group of radio and TV programmes and 655 political opinion articles from the headlines selected from the press were codified and the following data gathered: date broadcast/published, the media outlet, the total number of debates (except for opinion articles that only indicate the contributor), the genre of the participants and the identification of the content of the piece based on key words, which were proposed based on the codification of the issues that appear in each piece in an accumulative way, up to a maximum of six issues per piece. From the article about the press content during this same electoral process (author et al., 2017), the codification study of the debate spaces on radio/TV programmes and the first 1000 tweets analysed for each political party (5000 in total), a list of 350 issues was created and between one and six of these were assigned to each piece, be it a press opinion article, a radio or TV debate or a tweet from a political party, according to the issues they covered. The 350 issues were then grouped by conceptual similarity into 34 broad categories, from which 18 with sufficient weight were selected, from now on referred to as the top18, to represent the AS for the period under study. (1) pacts (the politics of pacts between parties, dialogue, understanding, forming a government, the great coalition pact PP-PSOE, in favour of a national pact PP-PSO-C's, pact C's-PSOE, governing from the centre, from the presidency of Congress, and so on; (2) Catalan independence (against nationalism/separatism, sovereignty of the Spanish nation, in favour of Spanish unity, conservatism and against the right to decide in Catalonia, Catalan cultural policy, difficulties in forming an autonomous government in Catalonia, in favour of an agreed, legal referendum in Catalonia, and so on; (3) gender inequality and domestic violence (on sexist comments from certain politicians, proposals for the law on domestic violence, labour conciliation, sexual abuse, violence against women, and so on; (4) terrorism (the Syrian war, jihadism, DAESH, ISIS, ETA, and so on); (5) corruption (tax amnesty, under indictment, tax fraud, parliamentary immunity, IMF Lagarde case, and so on); (6) politainment (candidates’ participation in talk shows, political discussions or entertainment shows); (7) economy/crisis (the global economy, the Spanish economy, austerity, cutbacks, economic recovery, bailout, at risk of poverty, campaign promises about Personal Income Tax and taxes, and so on); (8) institutional stalemate (ungovernability, post-electoral state, blockage in forming a government, failure to reach an agreement); (9) education (reform of the Law on Education, Vocational Training, grant system, academia and science, and so on); (10) regeneration/change (old politics, new parties, end of the two-party system, the traditional parties, resistance to change, fragmentation of parties and votes, and so on); (11) constitutional reform (national transition, territorial reform of the privileges of the Spanish regions, and so on); (12) statistics and CIS (publishing statistics, CIS –Centro de Investigaciones Sociológicas [Sociological Research Center], evolution of the vote during campaigns, electoral law, election exit polls, and so on); (13) voting/electoral process (campaign launch, floating vote, anarchy and not voting in elections, tactical voting, postal voting, reflection forum, electoral commission, and so on); (14) debates (following electoral debates on TV); (15) international politics (Spanish-European relations, European politics, refugees, international politics, and so on); (16) the environment (climate change, the environment, Paris Congress, and so on); (17) PSOE crisis (PSOE leadership crisis, internal dispute between socialist barons, and so on); (18) assault on Rajoy (youth assaulting President Rajoy during a campaign rally). The results derived from applying the CoDa method to the data obtained from the content analysis are shown below. In essence, this is the visualization of intermedia AS by the two actors, the main media groups (media agenda) and the main political parties (political agenda), for the 2015 electoral period. Following the framework set out in Table 4 and taking into consideration the data on the set of tweets codified for the political parties, intermedia AS by the media outlets and political parties is represented within the structure of the biplot. 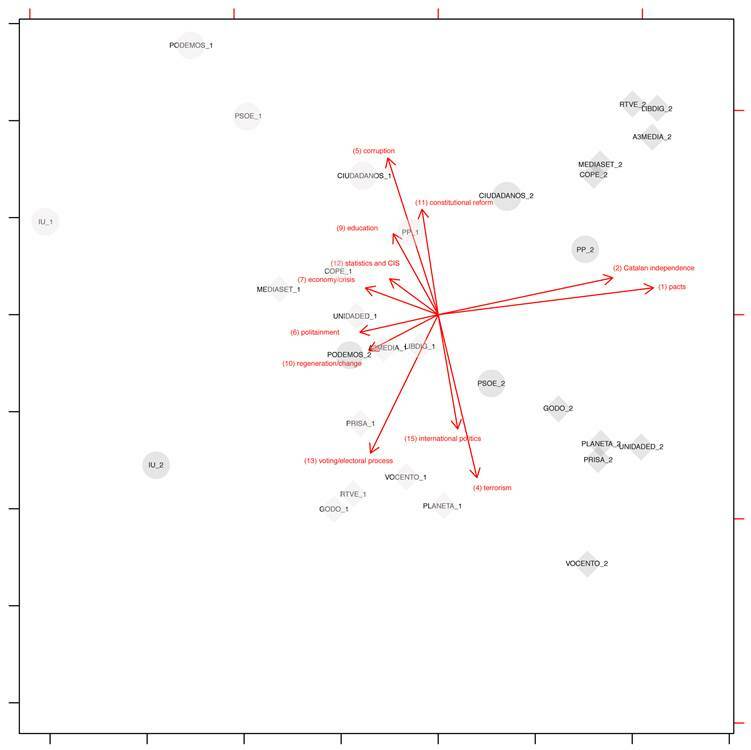 Figure 1 shows the intermedia AS for the whole period and from the form biplot, which locates the top18 issues and their senders (media groups and political parties) under the premise that the interest lies in the relative/comparative volume of the contents and not in the absolute volume which, as discussed earlier, traditional statistical methods do not allow for. A first formal reading notably reveals that the degree of representation of the variables-vectors (issues) in the analysis of principal components is highly reliable, given that the first two components together explain 67.7% of the total variance. The senders that behave similarly with respect to the content composition of their agendas can be deduced from the form biplot in Figure 1. A first general reading, for example, clearly shows that there are two blocks of senders in the set of intermedia AS: All the media groups are located to the left of the horizontal axis and all the political parties are located to the right of it. In other words, the AS issues that are covered proportionally more by opinion formers from media groups and the vector-issues that are the focus of interest in the communication of the political parties are quite clearly distinct. We can thereby conclude that the media groups send similar compositions on the horizontal axis (from right to left), such as (4) terrorism, (8) Institutional stalemate, (17) PSOE crisis and (18) assault on Rajoy; and that this content is markedly different from that of the political parties (from left to right), who in this case focus more on: (9) education, (11) constitutional reform, (7) economy/crisis, (14) debates, (3) inequality and domestic violence and (10) regeneration/change. In this regard, some senders are notably prominent, namely the political party IU and the media outlets Libertad Digital, Vocento and RTVE. IU is obviously distanced not only from the most prominent issue composition among the political senders, but also from the overall construction of intermedia AS. 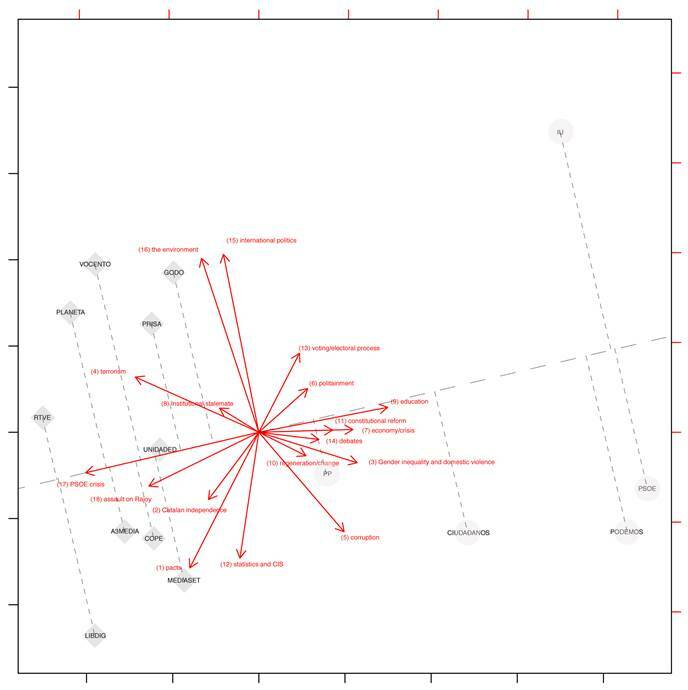 Libertad Digital and Vocento, followed closely by RTVE, stand out as the outlets that are furthest from the centre of coordinates that make up the issues-vectors, an aspect that is especially interesting in terms of constructing this visualization method as it serves to interpret the level of proportionality in establishing the issues of each sender in relation to the top18 group that comprise the representation of intermedia AS. In other words, if we take the centre of the diagram as the paradigm of proportionality (i.e., the point that corresponds to the senders that cover the set of top18 issues in the same proportion as the overall proportion of all the senders) and we look at the distance of each sender from the centre, we can order the senders that most closely to least closely mirror this proportionality in their coverage of the set of issues analysed. From this perspective and based on a general reading of the political parties and the media groups, it can be seen that the sender that covers the top18 issues in a proportion most similar to the overall proportion of the set of parties is PP. IU, on the other hand, is the sender whose coverage of the top18 issues mirrors the overall proportion least; in other words, certain issues occupy more space in their agendas than others. Another interesting point is that the political party senders tend to be further away from the centre of coordinates in comparison to the media groups, who share a similar axis on the distances to the centre of coordinates. The relative position of each content sender in relation to the centre indicates that from IU (the furthest from the centre) to PP (the nearest) there is a scale of inequality in the coverage of the issues set on the agenda. In other words, this scale corresponds to a group of senders talking ‘a little about a lot of issues’ (most obviously the case of PP) or ‘a lot about few issues’ (which is clearly the case of IU). Also worth highlighting, and as mentioned earlier, the state-owned media group RTVE is considerably distant from the centre of proportionality of the AS, with its axis located on the theme line (17) PSOE crisis, (18) assault on Rajoy and (4) terrorism. However, if we look at the political senders and the media outlets separately, the following points must be made: in the former group there is an obvious grading effect that goes from PP, through C’s and Podemos to PSOE and IU in relation to ‘talking a little about a lot issues’ to ‘talking a lot about a few issues’; whereas, interestingly, two spaces of media outlets groups are created depending on whether they are associated solely with the press (top left of Figure 1: Vocento, Godó, Planeta and Prisa, even though the latter includes the radio station Cadena SER) or with audiovisual media (bottom left, paying particular attention to Mediaset, Atresmedia, COPE and Libertad Digital). As defined earlier in the section on the methodological composition, in the biplot in Figure 1 the study focus is the issues that make up intermedia AS and their relationships with the senders. In brief, these relationships that are established among issues and senders in terms of proportionality outline a particular scenario for each sender of intermedia AS and the issues that are covered to some degree. Furthermore, they also reflect the similarities and differences in the prioritization of the issues in the agendas proposed by the different senders. For example, if we project the media outlets orthogonally in the direction of the content (17) PSOE crisis (letting them fall at an angle of 90 degrees to the direction defined by each vector-issue as represented by the broken line), two important phenomena can be seen: i) in the proportional order of the senders covering this issue from most to least, we find first the entire block of media outlets (media agenda) followed by the political parties (political agenda); ii) notably, RTVE together with Libertad Digital are the senders that cover the PSOE crisis most, while it is PSOE themselves together with IU who cover this issue least within the context of intermedia AS. In this way, each issue can be associated with certain senders. As previously indicated, the issues oriented particularly along the horizontal axis are representative, indicating the differences between the most prominent issues in the political agenda and in the media agenda. Focusing now on the issues located more along the vertical axis, we find IU, Godó, Vocento and Planeta with (15) international politics and (16) environment; IU with (13) voting/electoral process and (6) politainment; Libertad Digital, Mediaset, C’s, PSOE and Podemos with (5) corruption; Libertad Digital, Mediaset, A3media, COPE, C’s and Podemos with (12) statistics and CIS; Libertad Digital, Mediaset, A3media and COPE with (1) pacts and (2) Catalan independence. The visualization of the biplot on the compositional treatment of the data takes on another significance level in the transition from a static visualization model of intermedia AS to a dynamic conception. A practice widely used among academics interested in the AS theory consisting of comparing the agendas of one or more actors (for the context of intermedia AS) in two different time periods must be developed to shape this dynamic representation. Following this structure, a dynamic scenario to study the agenda is thus shaped here which, within the context of compositional analysis and its representation with biplots, is especially interesting to visualize the dynamics of the presence/absence or omission/signification of issues. In other words, this representation allows the dynamics established by the thematic hierarchization process and AS itself to be visualized, resulting in the signification of certain issues to the detriment of others, which are relegated or omitted depending on the time context. Figure 2 illustrates how in the transition phase between the electoral campaign period (where the senders are identified by a 1) and the second post-electoral (identified by a 2) behaviour complementary to the previous statistical visualization in Figure 1 can be deduced. More specifically, if again the space is divided by the axis of ordinates that crosses the point of origin of the coordinates, what can be seen is a group of issues on the left that are clearly associated with the electoral campaign period and a group on the right that are obviously positioned in the post-electoral phase. Furthermore, of particular interest is the fact that the second period (post-electoral) is dominated, proportionally speaking, by just two of the 12 issues, namely (2) Catalan independence and (1) pacts. Six issues are located in an intermediate space between periods: (13) voting/electoral process, (15) international politics, (4) terrorism, (11) constitutional reform, (5) corruption and (9) education, indicating similar coverage among senders during the two periods. At the same time, we can see how in the electoral campaign period the political parties and the media outlets are still dispersed like in the previous figures, while in the post-electoral period the agendas of the two sender groups are appreciably closer to one another. In effect, focusing on the post-electoral context, two parties can be seen to coexist in the top right-hand quadrant of the biplot (PP and C’s) together with five media groups (RTVE, Libertad Digital, Atresmedia, Mediaset and COPE), while in the lower right-hand quadrant there is only the political party PSOE sharing the space with the groups Godó, Planeta, Unidad Editorial, Prisa and Vocento. Furthermore, the parties Podemos and IU are the only senders distanced from the issues shared by all the other senders in the second post-electoral period. In both cases, the only quadrant change is in the left space of the biplot (from the first period, where it is found in the upper space, to the second period, where it is located in the lower space), an aspect which defines the two parties in a composition similar to the issues whose vectors go from right to left or from left to right for both periods, far removed from the dynamics of the other senders in the transition period from the electoral campaign period to the post-electoral period. In relative and comparative terms, in the post-electoral period Podemos and IU focus their tweets more on (13) voting/electoral process, (15) international politics and (4) terrorism compared with in the electoral campaign period. Two important aspects of Figure 2 must be highlighted: First, we see how like in Figure 1 with the top18 issues, there is a concentration of media outlet senders on the electoral campaign issues and, consequently, a similar composition of media agenda. The political agenda, on the other hand, is more dispersed. Furthermore, the composition of issues that are covered comparatively more in the first period (12) statistics and CIS, (7) economy/crisis, (6) politainment and (10) regeneration/change is clearly broader than in the second period (where only two of the twelve issues (2) Catalan independence and (1) pacts make up the thematic composition). As pointed out previously, this phenomenon indicates than in the electoral campaign space the agenda is characterised by talking ‘a little about a lot of issues’, while in the post-electoral campaign, where the composition of issues is much more concentrated, there is a tendency to talk ‘a lot about a few issues.’ The second characteristic identified in Figure 2 is again related to the composition of media outlet senders in the biplot in the two periods. Like in the previous biplot, again in the second period there is a concentration of media outlets related to the press, as opposed to audiovisual outlets. This characteristic appears altered in the first time period, where this differentiation is not as noticeable. In short, an interesting composition of media outlets that depends on their type is visualised in the electoral and post-electoral spaces. Last, it is important to remember that the fact that the media groups (media agenda) and the political parties (political agenda) do not share a same issue composition space in the biplot does not mean that they do not share a same agenda. It must be borne in mind that the issues that make up the intermedia AS were delimited beforehand by means of a content analysis and a codification/categorization process that was identical for both senders. In this sense, the effects of the dispersion of issues, visualized in certain periods among the political parties and media outlet senders, add value to a proportional prominence of the issue composition depending on the type of senders and under a same agenda scenario. Thus, if the thematic space is constructed under a same content framework, it is also true that the compositional approximation promotes the study of the proportional importance of each issue in the AS. Applying the compositional focus CoDa to the study of intermedia AS, in this case through the media and political agendas during the period of the 2015 Spanish general election, allowed us to visualise not only the agendas of each sender, but also intermedia AS by the actors in an intuitive way. It also helped to focus the analysis on the relative importance of each content to identify in a diaphanous way which parts of the whole emphasise which contents, which parts are more similar to or dissimilar from each other, which contents are presented in similar or dissimilar ways by the parts and even which contents are subject to a process of omission/prioritization. Likewise, applying this method allowed us to define the distances between senders (media outlets and political parties) in a meaningful way, emphasising the factor of proportions and avoiding the methodological flaws of the methods based on correlations, rankings, frequencies and c2 tests. Regarding the case study on the intermediation of the media and political agendas, some contributions must be highlighted. This study has proven the advantages of observing the intermediation processes of the agendas of different actors compositionally when the goal is to simultaneously locate each sender within the context of a proportional content composition and to visualize the interrelations between the other actors that define the composition of the agenda. Furthermore, the comparative analysis of the agendas also facilitates comparing actors by type (political and media actors and, in the case of the media, the audiovisual media and the press), thus contributing to an exercise of primary analysis among equals, which is complemented in the second level of study by the type of each sender within the observed set. Last, the contribution of the method in its dynamic phase on compared periods of time must be pointed out as this facilitates identifying the volume and content of the issues that characterise the agenda in each cycle, in addition to the composition of senders and, consequently, the effect of the framework on the agendas that these represent. This same method is also highly recommended for paradigms of data collection based on text mining and to visualise content analysis processes in communication sciences, especially those derived from media studies. More specifically, within the field of communication sciences this research has demonstrated the usefulness of the method for visualizing the representation of intermedia AS in the study of media and political agendas. The study on the presence/absence of issues and their evolution over two compared periods of time serves as a pretext to visualise the agendas in a proportionality space, which contributes to reaching significantly more complete conclusions. This research has taken the prominence of issues among the agendas of different actors (media and political) to the field of compositional representation, in line with the postulates of the first perspective of the Acapulco typology (McCombs, 2006). Furthermore, the study proposes a methodological tool that is more focused on the importance of the relative among issues and senders that can be used for both cross-sectional and longitudinal studies. In conclusion, an oft-mentioned limitation of CoDa must be mentioned: it is not a suitable method for sparse data tables. As stated previously, zero replacement methods (Martín-Fernández et al., 2015b) when their number is reduced do exist. Nonetheless, this limitation can be minimised by developing AS studies with a larger volume of data covering more articles, programmes, tweets, and so on, and also by applying a two-stage issue codification/categorisation process that allows various sub-issues to be included within a similar broader issue (category), known as amalgamation in CoDa terminology. Additionally, for studies on intermedia AS where the spectrum of senders is wider, groups of media outlets or political party coalitions could also be amalgamated and explained under certain premises. Last, attention must be paid to dynamic visualization spaces which, as mentioned previously, can entail the proliferation of zeros when there are issues that completely stop being covered in a delimited period. As a first solution in the case of the present study, the group of issues was reduced in number by eliminating those linked to a single period, even though this limitation could also have been overcome by constructing the agenda with issues represented in both study periods. Funded research. -- The results of this paper are part of the first signatory’s PhD research project entitled ‘Compositional analysis (CoDa) as a tool for mapping the agenda-setting theory. A case study of political opinion in the Spanish media system during the period of the 2015 general elections’, which was financed by the programme for researchers in training IFUdG2015 of the University of Girona and the 'Ibero-American Santander Research Grant 2016' of the Santander Universities programme of the Bank of Santander. The other authors were funded by the Catalan Autonomous Government Consolidated Research Group Grant 2014SGR551 through the research group ‘Compositional and Spatial Data Analysis (COSDA)’, the Spanish Health Ministry grant CB06/02/1002 through the research group ‘CIBER of Epidemiology and Public Health (CIBERESP)’, the FEDER/Spanish Economy and Competitiveness Ministry grant MTM2015-65016-C2-1-R through the project ‘COmpositional Data Analysis and RElated meThOdS (CoDa-RETOS)’ and the University of Girona grants MPCUdG2016/069 and GDRCompetUdG2017. Opinion makers are understood here to be the group of actors that are invited by the mass media within the context of media debate to participate by manifesting an idea or opinion, in particular on current affairs talk shows on TV or on the radio or as columnists in the press). The present content analysis follows the seminal study by McCombs and Shaw (1972), who distinctly naturally integrated media information from the local press and TV under the construction of media agendas. The recommendations posited by McCombs, which we broaden to include audiovisual media services, are also followed to the press opinion articles as viable supports for knowing the media agenda (McCombs, 2006). Aitchison, J. (1982). “The statistical analysis of compositional data”. Journal of the Royal Statistical Society. Series B (Methodological), 44, 2, 139–177. Aitchison, J. (1983). “Principal component analysis of compositional data”. Biometrika, 70, 1, 57–65. Aitchison, J. (1986). “The statistical analysis of compositional data”. Monographs on Statistics and Applied Probability. Chapman and Hall, London. Aitchison, J., Barceló-Vidal, C., Martín-Fernández, J.A., Pawlowsky-Glahn, V. (2000). “Logratio analysis and compositional distances”. Mathematical Geology, 32, 3, 271-275. Aitchison, J., Greenacre, M. (2002). “Biplots of compositional data”. Journal of the Royal Statistical Society: Series C (Applied Statistics), 51, 4, 375-392. Batista-Foguet, J.M., Ferrer-Rosell, B., Serlavós, R., Coenders, G., Boyatzis, R.E. (2015). “An alternative approach to analyze ipsative data. Revisiting Experiential Learning Theory”. Frontiers in Psychology, 6, 1742. Berelson, B. (1952). Content analysis in communication research. New York, Hafner. Blumler, J.G., Gurevitch, M. (1995). The Crisis of Public Communication. London: Routledge. Blumler, J., Kavanagh, D. (1999). “The third age of political communication: Influences and features”. Political Communication,16, 209–230. Bruder, K. (2008). AgendaSetting of International News in the United States and Its Decline by Using New Technologies. Communication Senior Seminar. Alma College, California. Buccianti, A., Mateu-Figueras, G., Pawlowsky-Glahn, V. (2006). Compositional Data Analysis in the Geosciences: From Theory to Practice. London: Geological Society. Cohen, B. (1963). The press and foreign policy. Princenton University Press, New York. Conway, B. A., Kenski, K., Wang, D. (2015). “The rise of Twitter in the political campaign: Searching for intermedia agenda‐setting effects in the presidential primary”. Journal of Computer‐Mediated Communication, 20, 4, 363-380. Egozcue, J.J., Pawlowsky-Glahn, V., Mateu-Figueras, G., Barceló-Vidal, C. (2003). “Isometric logratio transformations for compositional data analysis”. Mathematical Geology, 35, 3, 279–300. Egozcue, J.J., Pawlowsky-Glahn, V. (2011). “Basic concepts and procedures”. En V. Pawlowsky-Glahn, A. Buccianti (Eds. ), Compositional Data Analysis. Theory and Applications, 13-28. New York, NY: Wiley. Eijnatten, F.M., Van der Ark, L.A., Holloway, S.S. (2015). “Ipsative measurement and the analysis of organizational values: an alternative approach for data analysis”. Quality & Quantity, 49, 2, 559-579. Fishman, M. (1983). La fabricación de la noticia. Tres Tiempos, Buenos Aires. Frederick, E.L., Burch, L.M. Blaszka, M. (2015). “A shift in set: examining the presence of agenda setting on twitter during the 2012 London Olympics”. Communication & Sport, 3, 3, 312-333. Fry, T. (2011). “Applications in economics”. En V. Pawlowsky-Glahn, A. Buccianti (Eds. ), Compositional Data Analysis. Theory and Applications: 318-326. New York, NY: Wiley. Gabriel, K.R. (1971). “The biplot-graphic display of matrices with application to principal component analysis”. Biometrika, 58, 3, 453-467. Gonzenbach, W. y McGavin, L. (1997). “A brief story of time: A methodological analysis of agenda setting”. En McCombs, M., Shaw, D. y Weaver, D. (Eds. ), Communication and Democracy: Exploring the intellectual Frontiers in Agenda-setting theory, 115-136. EEUU, Lawrence Erlbaum Associates. Greenacre, M. (2011). “Compositional data and correspondence analysis”. En V. Pawlowsky-Glahn, A. Buccianti (Eds. ), Compositional Data Analysis. Theory and Applications, 104-113. New York, Wiley. Igartua, J.J., Humanes, M.L. (Eds.) (2004). Teoría e investigación en comunicación social. Síntesis, Madrid. Jungherr, A., Schoen, H., Jürgens, P. (2016). “The mediation of politics through Twitter: An analysis of messages posted during the campaign for the German federal election 2013”. Journal of Computer‐Mediated Communication, 21, 1, 50-68. Kogovšek, T., Coenders, G., Hlebec, V. (2013). “Predictors and outcomes of social network compositions. A compositional structural equation modeling approach”. Social Networks, 35, 1, 1-10. Krane, M. (2010). The socially filtered media agenda: a study of AgendaSetting among news outlets on Twitter. University of Missouri, Columbia. Krippendorff, K. (1990). Metodología de análisis de contenido: teoría y práctica. Barcelona, Paidós. Lippmann, W. (1922). Public Opinion. Macmillan, New York. Liscano Fierro, J. M., Ortiz Rico, F. A. (2017). Modelos mixtos para datos composicionales: Una aplicación con resultados electorales en Colombia. Universidad Santo Tomás, Bogotá. López García, G. (2004). Comunicación electoral y formación de la opinión pública: las elecciones generales de 2000 en la prensa española. Valencia: Servei de Publicacions de la Universitat de Valencia. Luhmann, N. (1973). Ilustración sociológica y otros ensayos. Editorial Sur, Buenos Aires. Luo, Y. (2014). “The Internet and agenda setting in China: The influence of online public opinion on media coverage and government policy”. International Journal of Communication, 8, 1289–1312. Marcinkowski, F. (2014). “Mediatization of politics: Reflections on the state of the concept”. Javnost, 21, 2, 5–22. Marques De Melo, J. (1985). A opinão no jornalismo brasileiro. Petrópolis, Vozes. Martín-Fernández, J.A. Barceló-Vidal, C., Pawlowsky-Glahn, V. (2003). “Dealing with zeros and missing values in compositional data sets using non-parametric imputation”. Mathematical Geology, 35, 3, 253–278. Martín-Fernández, J.A., Palarea-Albaladejo, J., Olea, R.A. (2011). “Dealing with zeros”. En V. Pawlowsky-Glahn, A. Buccianti (Eds. ), Compositional Data Analysis. Theory and Applications, 47-62. New York, NY: Wiley. Martín-Fernández, J. A., Daunis-i-Estadella, J., Mateu-Figueras, G. (2015a). “On the interpretation of differences between groups for compositional data”. SORT-Statistics and Operations Research Transactions, 39, 2, 231-252. Martín-Fernández, J.A., Hron, K., Templ, M., Filzmoser, P., Palarea-Albaladejo, J. (2015b). “Bayesian-multiplicative treatment of count zeros in compositional data sets”. Statistical Modelling, 15, 2, 134-158. Mazzoleni, G. and Schulz, W. (1999). “Mediatization of politics: A challenge for democracy?”. Political Communication, 16, 3, 247–261. McCombs, M. y Shaw, D. (1972). “The agenda-setting function of mass media”. Public Opinion Quarterly, 36, 2, 176–187. McCombs, M. (2006). Estableciendo la agenda. Paidós Comunicación, Barcelona. Meraz, S. (2009). “Is There an Elite Hold? Traditional Media to Social Media Agenda Setting Influence in Blog Networks”. Journal of Computer Mediated Communication, 14, 682–707. Neuman, W. R. (1990). “The threshold of public attention”. Public Opinion Quarterly, 54, 2, 159-176. Orihuela, J. L. (2008). “Internet: la hora de las redes sociales”. Nueva Revista de política, cultura y arte, 119, 57-62. Palarea-Albaladejo, J., Martín-Fernández, J.A. (2015). “zCompositions—R package for multivariate imputation of left-censored data under a compositional approach”. Chemometrics and Intelligent Laboratory Systems, 143, 85-96. Parmelee, J. H. (2013). “Political journalists and Twitter: Influences on norms and practices”. Journal of Media Practice, 14, 291–305. Parmelee, J.H., Bichard, S. L. (2012). Politics and the Twitter Revolution: How Tweets Influence the Relationship between Political Leaders and the Public. Lexington Books, Lanham. Pawlowsky-Glahn, V., Buccianti, A. (2011). Compositional Data Analysis. Theory and Applications. New York, Wiley. Pawlowsky-Glahn, V., Egozcue, J.J., Tolosana-Delgado, R. (2015). Modeling and Analysis of Compositional Data. Chichester, Wiley. Perlmutter, D. D. (2008). “Political blogging and campaign 2008: A roundtable”. The International Journal of Press/Politics 13, 160–170. Pierotti, M.E.R., Martín-Fernández, J.A., Seehausen, O. (2009). “Mapping individual variation in male mating preference space: multiple choice in a colour polymorphic cichlid fish”. Evolution, 63, 9, 2372-2388. Revuelta, G. (2006). “Salud y medios de comunicación en España”. Gaceta Sanitaria, 20, 203-208. Rubio-García, R. (2014). “Twitter y la teoría de la Agenda-Setting: mensajes de la opinión pública digital”. Estudios Sobre el Mensaje Periodístico, 20, 1, 249-265. Strömbäck, J. (2008). “Four phases of mediatization: An analysis of the mediatization of politics”. The International Journal of Press/Politics, 13, 3, 228–246. Serrano, P. (2010). Traficantes de información. La historia oculta de los grupos de comunicación españoles. Madrid, Akal. Thió-Henestrosa, S., Martín-Fernández, J.A. (2005). “Dealing with compositional data: The freeware CoDaPack”. Mathematical Geology, 37, 7, 773-793. Towner, T. L., Dulio, D. A. (2012). “New media and political marketing in the United States: 2012 and beyond”. Journal of Political Marketing, 11, 95–119. Van den Boogaart, K. G., Tolosana-Delgado, R. (2013). Analyzing Compositional Data with R. Berlin, Springer. Vives-Mestres, M., Martín-Fernández, J.A., Kenett, R. (2016). “Compositional data methods in customer survey analysis”. Quality and Reliability Engineering International, 32, 6, 2115–2125. Wimmer, R. D., Dominick, J. R. (2006). Mass Media Research: an introduction. USA, Thomson Wadsworth. Wolf, M. (1991). La investigación de la comunicación de masas. Paidós, Buenos Aires. Article received on 24 November 2017. Accepted on 31 January. Published on 7 February 2018.